Beginning on July 24, Cowley College physics instructor Martin Shaffer was invited to participate in the American Association of Physics Teachers (AAPT) Two-Year College Leadership Institute in College Park, Maryland. The first day was spent at the American Center for Physics working on various skills and strategies needed to progress physics at two-year colleges. These ongoing discussions will continue throughout the year as all 20 attendants were required to create a project to help improve weaknesses in their physics programs at their schools. On Saturday, July 25, Shaffer headed to Montgomery College in Germantown, MD and to the Two-Year College (TYC) tandem meeting hosted by AAPT. Here he spent the day in the Bio-technology facility to learn about ways to integrate biology with physics in a variety of ways for students who take physics but are not planning on going into physic or engineering. Workshops attended included “Pre-pharmacy Applications in Algebra Based Introductory Physics”, “How Physics Helped Solve the Mystery of DNA” and “Are You Asking the Right Questions in Your Astronomy Class?”. 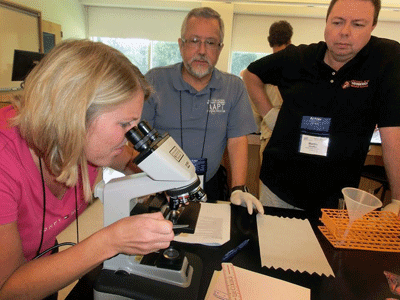 On Sunday, July 26, the National AAPT conference at the University of Maryland in College Park began. From Sunday until Tuesday, Shaffer spent the days (and evenings) attending talks, workshops, plenaries and committee meetings. Shaffer arrived a few days earlier and had a chance to tour Washington, DC. Among the places he visited were Ford’s Theater, The National Archives, The Air & Space Museum, The Natural History Museum, The Washington Monument, and Arlington National Cemetery.